Series, DataFrame, and Panel all have a method pct_change to compute the percent change over a given number of periods (using fill_method to fill NA/null values before computing the percent change). The Series object has a method cov to compute covariance between series (excluding NA/null values). Analogously, DataFrame has a method cov to compute pairwise covariances among the series in the DataFrame, also excluding NA/null values. Assuming the missing data are missing at random this results in an estimate for the covariance matrix which is unbiased. However, for many applications this estimate may not be acceptable because the estimated covariance matrix is not guaranteed to be positive semi-definite. This could lead to estimated correlations having absolute values which are greater than one, and/or a non-invertible covariance matrix. See Estimation of covariance matrices for more details. DataFrame.cov also supports an optional min_periods keyword that specifies the required minimum number of observations for each column pair in order to have a valid result. All of these are currently computed using pairwise complete observations. Please see the caveats associated with this method of calculating correlation matrices in the covariance section. Note that non-numeric columns will be automatically excluded from the correlation calculation. A related method corrwith is implemented on DataFrame to compute the correlation between like-labeled Series contained in different DataFrame objects. rank is also a DataFrame method and can rank either the rows (axis=0) or the columns (axis=1). NaN values are excluded from the ranking. rank optionally takes a parameter ascending which by default is true; when false, data is reverse-ranked, with larger values assigned a smaller rank. 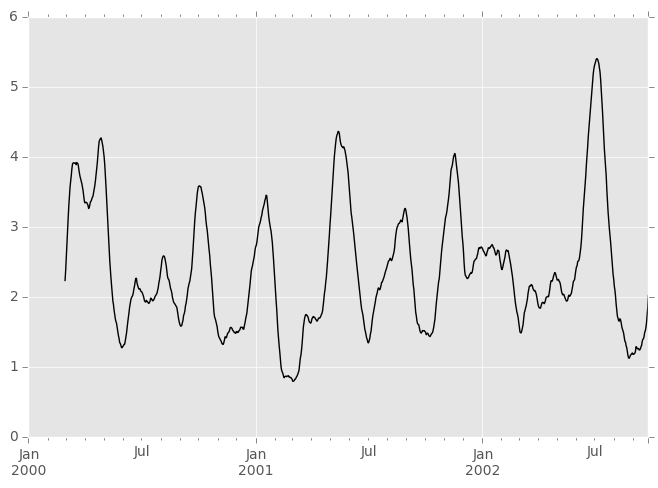 For working with time series data, a number of functions are provided for computing common moving or rolling statistics. Among these are count, sum, mean, median, correlation, variance, covariance, standard deviation, skewness, and kurtosis. All of these methods are in the pandas namespace, but otherwise they can be found in pandas.stats.moments. how: optionally specify method for down or re-sampling. Default is is min for rolling_min, max for rolling_max, median for rolling_median, and mean for all other rolling functions. 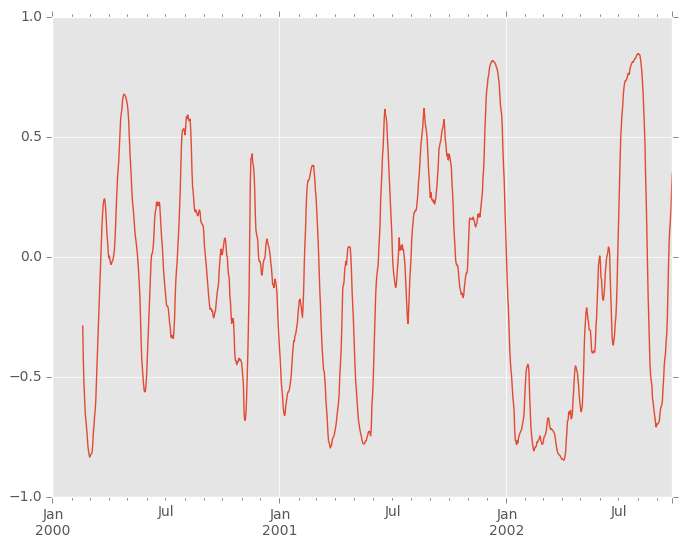 See DataFrame.resample()‘s how argument for more information. Note that the boxcar window is equivalent to rolling_mean. By default the labels are set to the right edge of the window, but a center keyword is available so the labels can be set at the center. This keyword is available in other rolling functions as well. In rolling sum mode (mean=False) there is no normalization done to the weights. Passing custom weights of [1, 1, 1] will yield a different result than passing weights of [2, 2, 2], for example. When passing a win_type instead of explicitly specifying the weights, the weights are already normalized so that the largest weight is 1. In contrast, the nature of the rolling mean calculation (mean=True)is such that the weights are normalized with respect to each other. Weights of [1, 1, 1] and [2, 2, 2] yield the same result. two Series: compute the statistic for the pairing. DataFrame/Series: compute the statistics for each column of the DataFrame with the passed Series, thus returning a DataFrame. DataFrame/DataFrame: by default compute the statistic for matching column names, returning a DataFrame. If the keyword argument pairwise=True is passed then computes the statistic for each pair of columns, returning a Panel whose items are the dates in question (see the next section). Missing values are ignored and each entry is computed using the pairwise complete observations. Please see the covariance section for caveats associated with this method of calculating covariance and correlation matrices. Prior to version 0.14 this was available through rolling_corr_pairwise which is now simply syntactic sugar for calling rolling_corr(..., pairwise=True) and deprecated. This is likely to be removed in a future release. Like the rolling_ functions, the following methods are included in the pandas namespace or can be located in pandas.stats.moments. min_periods: threshold of non-null data points to require. Defaults to minimum needed to compute statistic. No NaNs will be output once min_periods non-null data points have been seen. The output of the rolling_ and expanding_ functions do not return a NaN if there are at least min_periods non-null values in the current window. This differs from cumsum, cumprod, cummax, and cummin, which return NaN in the output wherever a NaN is encountered in the input. where is the input at is the result. These equations are sometimes written in terms of , e.g. One must specify precisely one of the three to the EW functions. 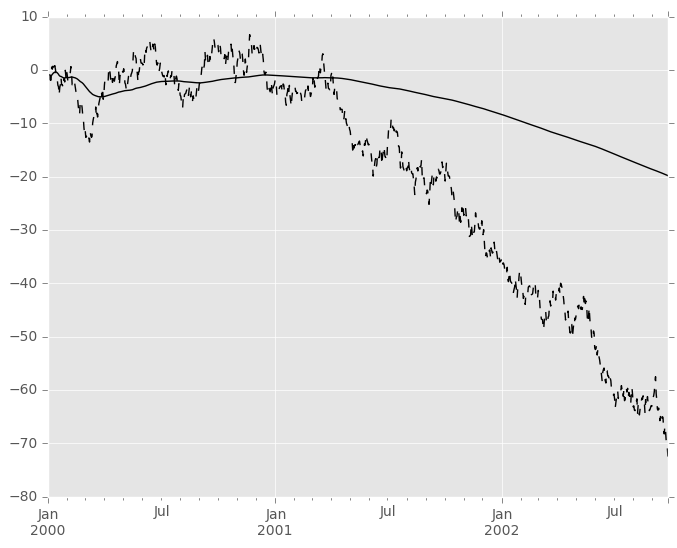 Span corresponds to what is commonly called a “20-day EW moving average” for example. Center of mass has a more physical interpretation. For example, span = 20 corresponds to com = 9.5. Halflife is the period of time for the exponential weight to reduce to one half. (For , this reduces to the usual factor, with .) 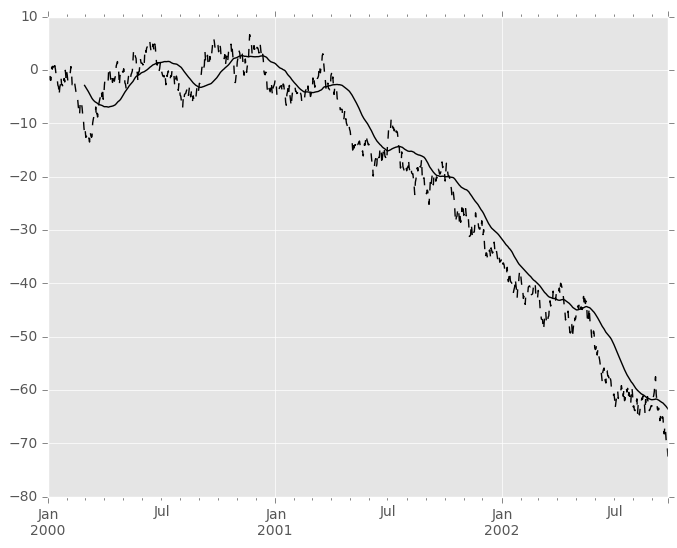 See http://en.wikipedia.org/wiki/Weighted_arithmetic_mean#Weighted_sample_variance for further details.